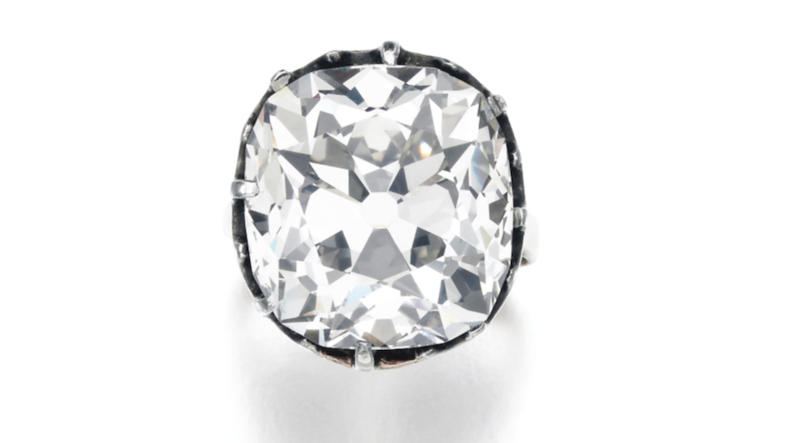 Jessica Wyndham, head of Sotheby's London jewelry department, revealed to the BBC that a 26.27-carat cushion-shaped white diamond from the 19th Century is expected to be auctioned by the house for over 300,000 euros, but it was originally bought for £10. The diamond is encrusted in a ring that a woman bought at West Middlesex Hospital in Isleworth, west London, in the 1980s. She wore it every day for three decades, as she assumed it was not a genuine gemstone. Recently, a jeweler told her it may be valuable and she decided to take it to Sotheby’s, where they later got it tested by the Gemological Institute of America. According to Wyndham, the owner had been to quite a few car-boot sales over the years, but she has no history of collecting antiques or diamonds. “This is a one-off windfall, an amazing find,” she said. The expert explained that the woman had assumed the ring wasn't worth much due to its shape, cut and lack of sparkle. “With an old style of cutting, an antique cushion shape, the light doesn't reflect back as much as it would from a modern stone cutting. Cutters worked more with the natural shape of the crystal, to conserve as much weight rather than make it as brilliant as possible,” she told BBC.